The New York Times article, “A Place to Hang Out (Read, too),” explores the redesign of Donnell Library Center, located at the base of a high rise hotel across the street from the Museum of Modern Art. 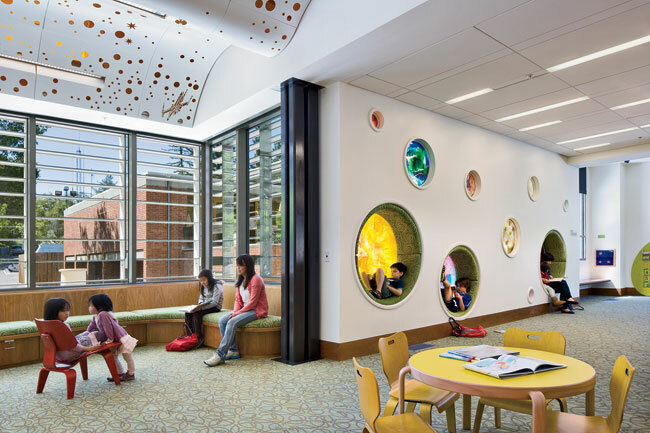 This article case study’s an example of what seems to be a larger emerging trend in library design and illustrates the changing role of libraries in American cities today. In this digital age, with information at the touch of a finger, there is a great debate over the role of libraries. 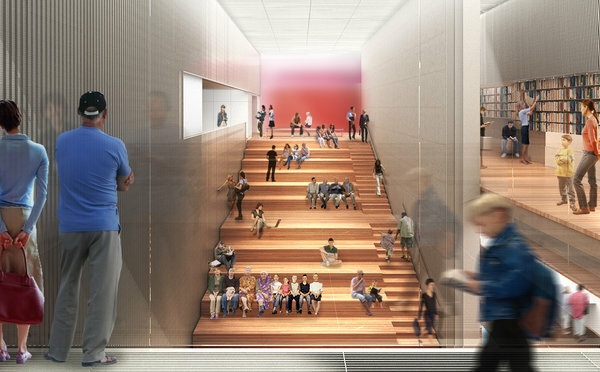 New library design has placed more emphasis on spaces for people to connect than for book storage and shelving. As their civic roles become broader; the library must adapt to the needs of the diverse, technologically trained population. With your favorite book or article just a click away, libraries need to redefine their roles within the community while maintaining a creative, welcoming space that still maintains the values of reading and learning. The future of the library depends on the adaptability of the design to allow for the ever changing uses and variety of functions now expected. Library design not only has the challenge of meeting the needs of a diverse population, both young and old, but must also keep up with the change in how we access information. The library counter is no longer the focal point of the space as self-service machines free up staff to spend more time with library users, organizing storytelling sessions and other community engagement events. In addition to traditional library elements, wi-fi access and a dedicated place to access it is a main driving factor behind the success, popularity, and usage of a library. By offering collaboration spaces, quiet study areas, media centers, Internet cafes, rental space, sitting areas and program rooms, the space left for books continues to diminish. Sustainable principles of daylighting and indoor air quality have become key factors to an inviting atmosphere. Incorporating these principles along with clear organization, delineation of space, and graphics help to attract patrons and create a space for them to hang out and enjoy. These changes to library design are controversial topics, as many people in the community grew up with the library and have a great sense of pride and nostalgia for it. For this reason, a careful study of each library’s demographic and present technological needs must be accounted for before beginning a redesign or renovation project. Having lasted over several centuries, libraries aren’t going anywhere. Many people still view the public library as a community treasure containing a wealth of information and resources. With modifications to the design and an open mind about adaptation to technology, the library will continue to thrive in our communities for many years to come. To view the current K4 Avondale Branch Library project, please click here.